City on Lockdown is an urban bike messenger event that will bring the cycling community and race enthusiast together. This will be a three day event, with a point system building up through each day. When each day is over, we will be giving out prizes for the top 3 female and top 3 male racers. Track Bike racers (fixed geared) can build points by coming in top 3 in each event to win the overall prize on Sunday. You can race track or road,whichever one you decide. The overall prize is only for the Track King and Track Queen, to hold the title of City On LockDown. Day one will have two races, a Criterium Race at the Rose Bowl, (to see some of the fastest sprinters) and an Alleycat in DTLA (to get know your city better). The second day will be a road stage. The race starts in downtown and will go around Los Angeles. The course will have sprint and climber check points. At the finish line, food and drinks will be provided to the registrants as well as host fun side events for everyone to participate in. 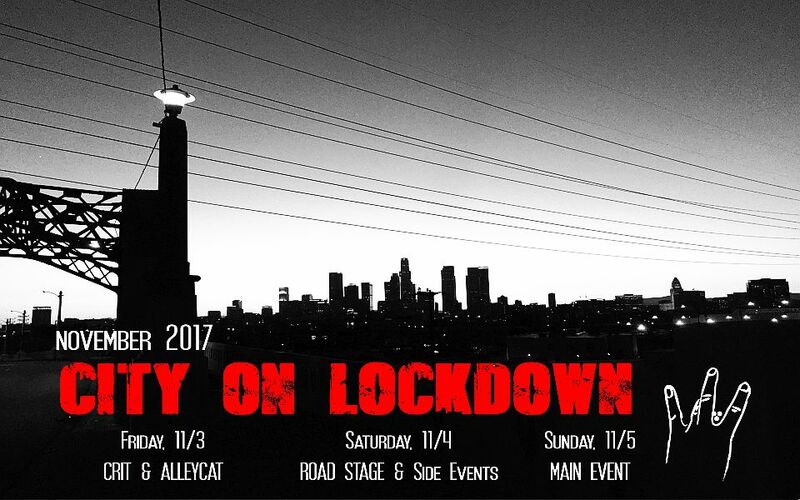 The third day is the main event, which will consist of a three hour race in DTLA to see who has the city on lockdown. Head over to the Five Star for our annual Día de los Muertos party with bands, food and awards. Pre-Registration [for all three days] is $25 online, at www.ticketor.com/cityonlockdown3 or $30, if you show up at Golden saddle to register. If you're under the age of 18 bring a legal guardian to sign a waiver in order for you to race. All registered racers will receive a T-shirt, patch, koozie, spoke card, race number (that you need to race with) and wristband for free food. Rose Bowl crit Registration at 12:00. Race will start at 1:00pm. Road bike category racers are welcomed to race for prizes but are not eligible in the overall point system.Track bike category racers will have one hot lap to earn extra points towards the overall three day title. The alleycat will start at Echo Park. Road stage will start at The Bridge.Registration is at 12:00 pm, rollout at 1:00 pm.Track and Road bike will race together on the course. For the overall Track title,extra points will be given to the 1st, 2nd,& 3rd place track racers that reach the sprint and climbers checkpoints. We will have food for the registrants at Angel’s Point at the end of the race.If you’re trying to win the overall title you will have the chance to earn more points on tracks skids,foot down and the track stand competition. Prizes will be given out after for road stage and side events. Registration at 12:00 pm at The Bridge. Race starts at 1:00pm sharp. You're going to need a U-Lock and messenger bag to race. Each racer will have 3 hours to complete as many manifests before the time runs out. To finish the race head back to the bridge and turn in all completed manifests that you did. Make sure your race number and your name is on the manifests. Whomever completes the most manifests will win this main event. Each completed manifest will grant track racers points towards the overall title to see who has the City On LockDown!! Our annual Dia de los Muertos after party will be at the Five Star bar, co-hosted by Al Trochi Mochi serving their famous vegan pozole. Live music, awards and stay tuned for more!